People who create with clay tend to dabble in futuristic predictions. Let me explain. 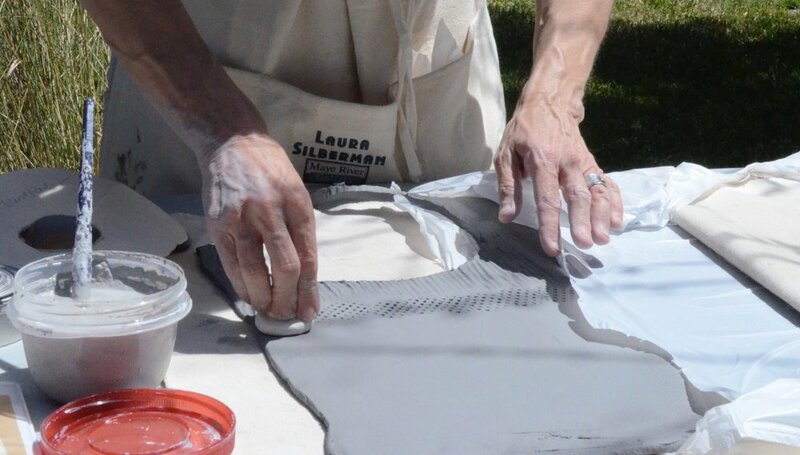 I usually begin each of my projects with a slab of clay. Experienced potters must have a plan to manipulate a lump or slab of clay into a specific form. Beginners might have a plan, but often abandon it because they have not built the skills necessary to successfully manipulate 'the mud'. I remember being happy just to turn my lump into something even resembling a pot! Mastery comes with repetition, practice and learning. 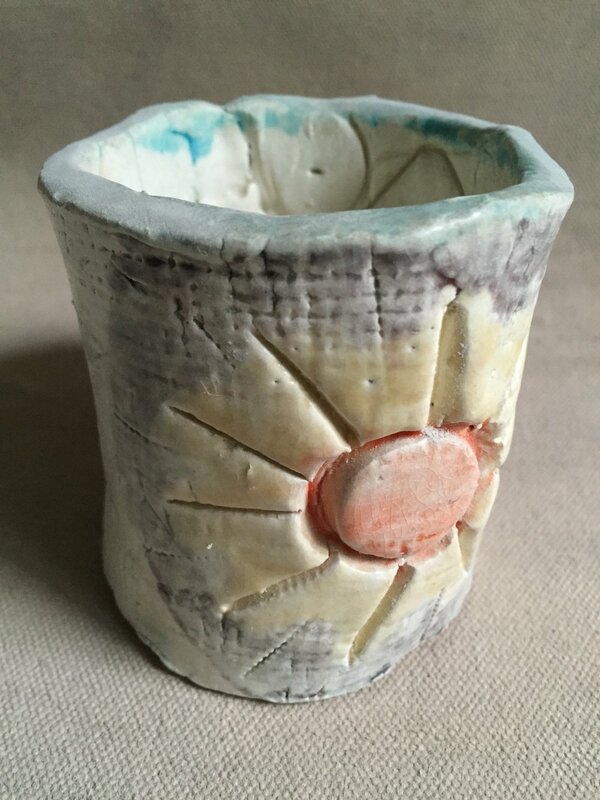 Here's one of the first pots I ever made in grade school. The imperfections have guided me toward improving my skills and appreciating its value. Decorating the clay form requires a leap of faith and practical knowledge too. Clay can be enhanced in numerous ways to add to its artistry. 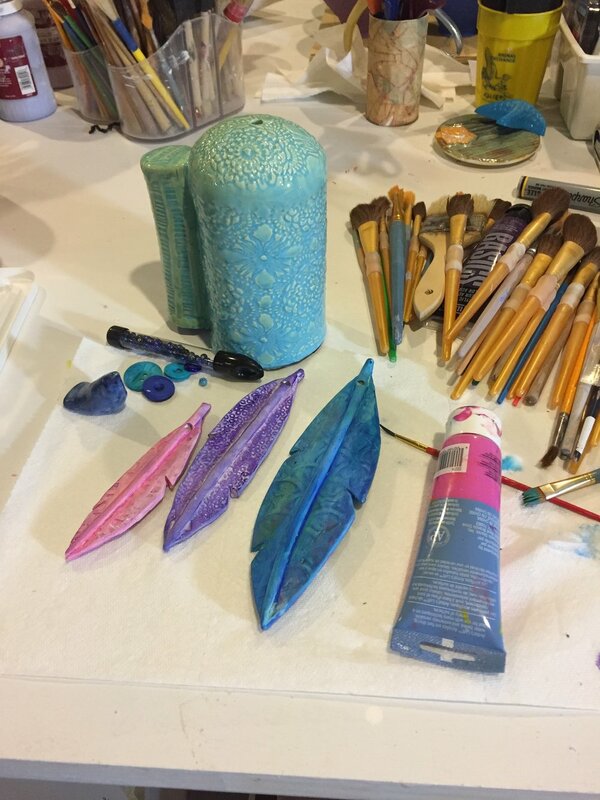 The clay surface itself can be carved, colored, stamped or embellished with additional portions of clay. These decisions must be made at specific junctures to succeed in the final outcome of the piece. Again -- experimentation, practice, learned skills and creative trust are ways a clay artist approaches each of these decisions during the pot-making process. The firing process adds a whole other layer of decisions and practical predictions to complete the pot. Clay-makers use fire, gas and electricity to solidify their art. Many things can go wrong during this critical phase including exploding pots, cracks or a myriad of glaze malfunctions. 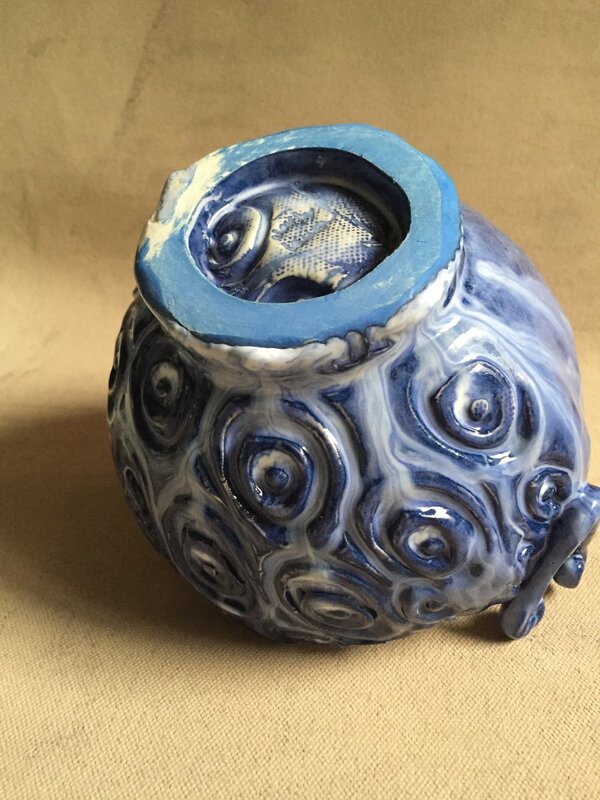 Sometimes the glaze color is not what was imagined; the glaze might run during the firing and adhere the pot to the kiln shelf; glaze can develop crackles or refuse to properly stick to a pot. Again, as experience is gained, clay artists learn to avoid the mishaps and achieve many more successes than failures. Here's one example of glaze running down the side of a pot and sticking to the shelf. I'm working on a garden bell for a totem in process. 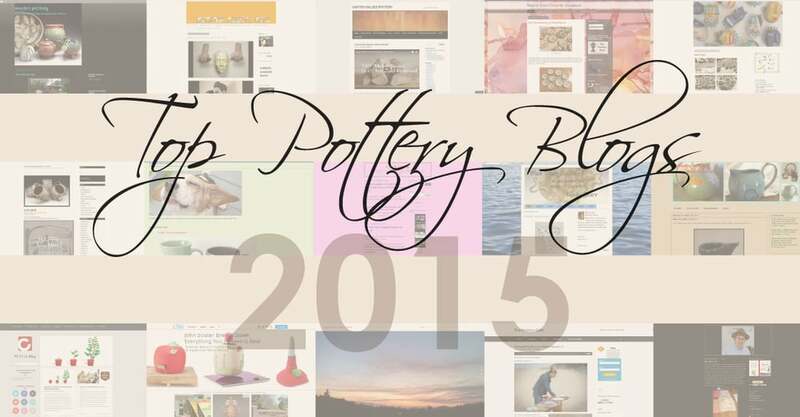 Here’s what I’ve learned over the years in my own clay journey. No one can absolutely predict the future. We may have built up all of the skills, accumulated all the right tools and followed the rules along the way – but the final outcome does not always cooperate with our initial vision. So many hours go into creating just one piece, when it does not come out the way we want – it can be disappointing. There are times too where the outcome far exceeds expectation -- which can be thrilling! So where’s the middle ground? I’m learning to accept and acknowledge my initial reactions to a finished piece. I try to learn from the positives and the negatives. I cannot change the outcome, but I can change my attitude. I still try to predict the final result of what I make. It’s necessary. But when things go a different way than I planned, I'm working on accepting that and moving on. Do you see a life lesson here? I hope so. I try to apply this studio experience to my own life. It’s a work in progress. How about you?